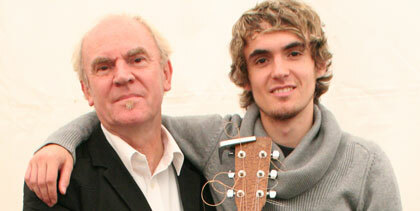 We have a great evening featuring Ashley Hutchings, one of the patriarchs of the British Folk scene and, taking time off from his UK tour, Horizon Award winning performer Blair Dunlop. Ashley and Blair will replace the previously advertised concert that featured Elbow Jane. We had to cancel that event due to circumstances beyond our control. Tickets will only be available at the door for this concert. If you have already purchased a ticket for Elbow Jane you can use it for this concert, swap it for any of our other concerts in this new season or obtain a refund. Please contact us by email or turn up on the 14th September to discuss your options. We apologise for the inconvinience this may cause you and we will do our best to make sure every one is content and has a great evening. Ashley and Blair will be supported by USA band Friction Farm.